The ATH-SR5BT Wireless On-Ear Headphones give you phenomenal Hi-Res Audio with the convenience of Bluetooth wireless technology operation. Up to eight devices (smartphones, tablets, music players, etc.) can be stored in the memory of the ATH-SR5BT for quick connection to your chosen devices. 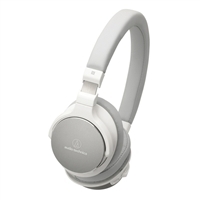 And adding or replacing devices is made even easier with the headphones NFC (Near Field Communication) functionality: just touch any NFC-compatible device with Bluetooth wireless technology to the N-Mark on the headphones and the device and headphones are automatically paired and connected.